This is why I can't do webinars from my current home. 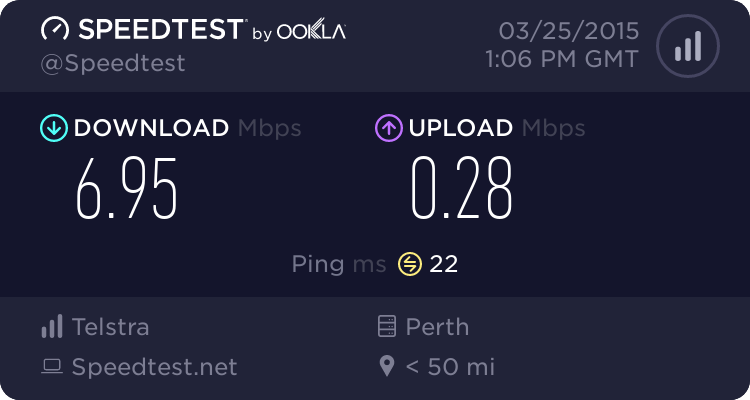 The upload speed is no doubt way too slow to cater for voice and screencast. Unfortunately I also seem to be in quite the dead spot for 4G wireless connection. Have you discovered the OTech Magazine yet? This magazine is a brainchild of Douwe Pieter van den Bos and is now five quarterly issues young. The "Winter 2014" is a bumper issue this time, plenty of reading during various downtime that's typically afoot. The season in particular deserves quotes, since outside my home it's currently 39C. I hope to publish something again next issue, should I find the time between a couple of other projects. It's worth the subscription. Note: I found this post in my drafts from late December. The next issue is due shortly where I've submitted an article on Pivot. That the APEX version 5 will become available. No doubt you've heard the news already, but I had to chuckle a little today as I did about an hour's work on a 3.2 environment. After playing with APEX 5 EA3, it was like jumping back into the 90's and using a 3.5" floppy. APEX 5 will be an amazing leap forward in browser based development, but Joel suggests a few changes to be aware of. Word on the street is APEX 5.1 will have a much shorter release cycle. This isn't the only post I've seen where Joel suggests more features will be just around the corner. I've finally bitten the bullet and disabled the Google+ commenting mechanism from this blog. I promised this in my 2014 annual review, and I figure I might as well not wait. When Google announced they would integrate Google+ with blogger, it sounded like a good idea at the time. However it required that commenters needed a Google+ account as opposed to having a number of authentication options. Unfortunately this means the many comments made since turning it on will disappear into Google+ land, and won't be visible from the relevant post. There's plenty on the topic out there, so much so I've lost whatever discussion I had with someone about it. It's a shame because some comments were particularly useful, with clarification coming from the APEX team regarding functionality in coming releases. It does mean the bugs that came with it also disappear. Google+ comments are still available in web cache ... for now. According to this site I think these comments may disappear from cache after three months, I'd be happy to be enlightened otherwise. Or you can click on the little arrow next to search results to open the cached version. I thought the Wayback Machine may also help but it doesn't seem to have archived any individual posts. At the end of the day I'll be happy if this encourages more people to provide feedback. It's a great way to learn, particularly when I make mistakes in my posts or something mentions a better way. Do you live in Perth, Western Australia? Do you use Oracle Application Express? Are you interested in seeing how easy it is to extend the product? Keen to see APEX 5 in action? RSVP: By Tuesday 17th March , using the buttons below or emailing vicepresident.wa@ausoug.org.au. Feel free to bring your laptop. Most of the session will be me hands on using APEX5, creating a page before your very eyes. And yes, there will be a flavour of science in my Prezi intro. Thanks to twitter I found this post by Carsten Czarski on LISTAGG and CLOBS that helped my with the 4000 character limit with LISTAGG(), found when building JSON strings. I follow a few bi-language blogs but I do wonder if English speakers may find this post when googling the issue. For me it's on page 1 when googling "listagg clob", but I knew what keyword to search after the fact. A little tip if you do find it - don't attempt to copy the code from the translated version of the page. It's amazing how many syntax issues were introduced by the translator, and logical issues that I wouldn't have noticed had I not performed a diff after things went wrong. Thank's Carsten for a useful solution using custom aggregate functions, an element of PL/SQL I'm yet to master. It's certainly faster than the XML solution, here is the throughput difference from 100 iterations of each. The simplest solution, however, would be to set up an RESTful service using ORDS. Another workaround involves a CASE statement.